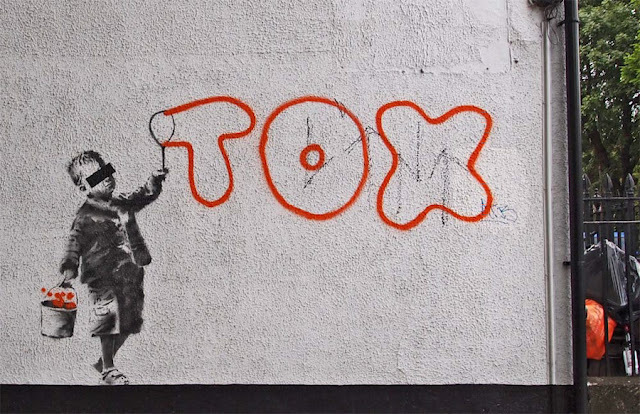 Popular yet unknown street artist Banksy has produced this stencil to generate publicity from the hype surrounding the imprisonment of graffiti writer Tox. A jury has found Tox, aka Daniel Halpin, guilty of criminal damage. He now faces possible prison time. "He is no Banksy. He doesn't have the artistic skills, so he has to get his tag up as much as possible." Glad we cleared that up. Obviously the law permits 'culturally significant' vandalism if it makes a wall on your property worth more than the property itself - or if it raises the profile of small villages like Bristol. There are stark paradoxes in the way graffiti and street art are simultaneously lauded and loathed. Public and bureaucratic perceptions of these art forms are polarised, but then sometimes not. Meanwhile, artists like Banksy become wildly popular, and trashy graff writers like Tox are sent to prison. The difficulty in placing graffiti and street art within the art history canon, the complexity in taxonomising them, means more arrests and more shocks are likely. Same thing happens in Newtown/Enmore, the yuppies love stencils & hate graff pieces. Graff pieces aren't 'cool' enough, there is no internationally accepted King of Graff! A Banksy stencil is instantly recogniseable as a stencil so there is no potentially embaressing guess work as to what or who it is, "Isn't that a Banksy?" Now we watch (authenticated?) Banksy street pieces being sold (& stolen) it changes street art in that ALL street art is seen as having a potential value & therefore theft is essentially investing! I agree, there is a big difference in public perception of what constitutes art or graffiti. I think part of the problem is that stencils and posters often appeal to the public whereas graff does not.